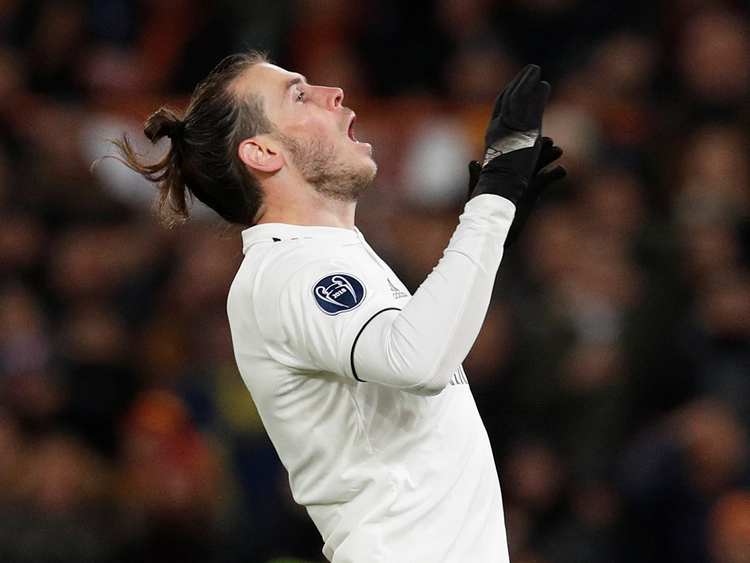 Rome: Gareth Bale helped Real Madrid beat Roma on Tuesday to ensure they will go through top of their Champions League group despite a chaotic start to the season. Bale scored one and then provided the cross that led to another as Lucas Vazquez wrapped up a clinical 2-0 win at the Stadio Olimpico. Roma squandered several chances in the first half, the best of them falling to Cengiz Under, who was guilty of a shocking miss from six yards, with the goal gaping. Federico Fazio’s mistake then gifted Bale the opener and Roma faded thereafter, allowing Madrid to bounce back from their shock defeat to Eibar last weekend by finishing top of Group G.
Both teams knew they had already qualified thanks to Viktoria Plzen beating CSKA Moscow in the early kick-off, making this a winner-takes-all contest for top spot. Madrid seized it, showing once again their magic touch in the Champions League, where the team’s problems in domestic competitions are seemingly never transferred. They have gone more than eight hours without a goal this season, and two weeks without a permanent coach, but Santiago Solari still leads Real into the knock-out stages as group winners with one game to spare. Solari might have felt relief after the disastrous display at Eibar on Saturday while the presure mounts for Roma coach Eusebio di Francesco. They have won only one of their last five Serie A games, and Antonio Conte was watching on in the crowd. There have been a fair few winners from Solari’s time at the helm but Isco has not been one of them. After not starting any of the new coach’s first five games, he was not even included on the bench in Italy. Marcos Llorente was parachuted in to fill the problem position in defensive midfield while Marco Asensio, yet to catch fire this season, dropped to the bench. A breathless first half was dominated by Roma but Madrid had the first chance. Vazquez plucked Bale’s cross out of the sky and cut back for Luka Modric, whose deflected shot was well saved by the foot of Robin Olsen. From there, the best chances belonged to the hosts as Raphael Varane seem to defy physics by diverting away from the boot of Patrik Schick and over his own bar. Stephan El Shaarawy hobbled off and his replacement, Justin Kluivert shot over. Schick failed to connect from close range. Madrid were hanging on, with one Roma assault leaving a handful of white shirts sprawled across the penalty area. Thibaut Courtois saved with his feet, Dani Carvajal blocked, before Aleksandar Kolorov fired off a trademark shot from range that whistled wide. The worst miss of the half, and perhaps the season, was to come. Carvajal dallied in the corner, teeing up Nicolo Zaniolo to cross. At the back post, Madrid had not recovered, neither had Courtois, who was scrambling from the other side of the goal but Under, under no pressure, blazed over. He trudged off at half-time and was consoled like he had missed a penalty, but it seemed inevitable Roma would pay for the error. They did, twice in 12 minutes. First, Fazio compounded Olsen’s poor clearance with an even worse header back, which landed at the feet of Bale and the Welshman made no mistake. Then Bale was involved in the second, a clipped cross finding Karim Benzema, whose clever header down gave Vazquez a simple finish. In between, Bale could have made it two himself when he set free on the break, as Roma lost momentum, shape and belief. Bale, Benzema and Modric were all taken off, rested for Valencia on Saturday, as an initially close contest became comfortable.